PRICE: $15.00 plus or minus a few dollars. 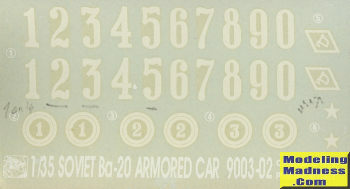 The BA-20 armored car was developed in 1934 for use by HQ staffs, reconnaissance and communications units. It was derived from the civilian GAZ-M1 car using its chassis, which was itself a modified version of a Ford design, produced by the Nizhny Novgorod-based vehicle manufacturer GAZ. Full production of the BA-20 started in 1935. The chassis was built at the Nizhny Novgorod factory; the body was built at the Vyksinskiy plant, where final assembly of the BA-20 occurred as well. The principal use of the BA-20 was as a scout vehicle. The BA-20's tires were designed to be resistant to bullets and shrapnel by the simple expedient of filling them with spongey rubber. A variant, the BA-20ZhD, could travel on railway lines by replacing the normal wheels with flanged metal rail-type wheels. The vehicle was exported to the Spanish Republican side in the Spanish Civil War, although the vast majority of BA-20s built served with the Soviet Red Army. They first saw combat in the conflict with Japan in 1939 on the Khalkin Gol river in Mongolia. The BA-20 was used by the Red Army in the Soviet invasion of Poland later in 1939 and the Winter War against Finland between 1939-40 in which Finland captured 18 designating them as PA-6, as well as the early stages of Operation Barbarossa in 1941. Production was ended that same year, with some 4,800 BA-20s having been constructed by that time. Some had flamethrowers instead of the DP-28. In common with most armored cars derived from cars, the BA-20 was largely roadbound. The lack of all-wheel drive, high ground pressure, and low power prevented it from moving cross-country except on very firm ground. The armor was too thin to stop anything other than fragments or small-arms fire, and the 7.62 mm machinegun was not adequate to penetrate other scout vehicles. The Red Army produced very few wheeled armored fighting vehicles in the war, but replaced the BA-20 with the BA-64B. As you can see from the box art, this is a reboxed Alan kit. Now I don't know a lot about Alan, and have heard comments that range from poor to good. This looks like one of the latter. The actual molding on the kit is quite nice. While I do see a bit of flash on a few parts, I don't see the thick mold lines nor any of the sink areas that I've seen on kits from, say, Maquette. Aside from the head light lenses, there are no other clear bits and the kit is contained within three grey sprues. This is a curbside with no engine detail save for the lower portion that is molded onto the chassis. It basically provides something to see on the underside and a place on which to glue the exhaust pipe. There is also a radiator, but no hoses or other bits. All the suspension pieces are separate and you get a three piece rear axle assembly. Fenders are molded onto the floor pan and there are two seats for the inside as well as a steering wheel and firewall. Frankly, there wouldn't be much to see anyway unless you chose to model this with the main doors open. In which case you'd want to add some additional detail. Most of the body panels are slabs as you'd expect save for the turret. This contains the single machine gun. There are separate armored covers for the radiato r and windows, but I think those are meant to be modeled closed. The kit also provides one of those 'bedframe' radio antennas along with their mounting posts. Wheels have the option to put wheel covers on them if you so wish. Instructions are a single folded sheet of paper and you have decals for at least six different options. Those that are described are from 1941. The overall color is a dark green, despite the cover vehicle seeming to be an olive drab. Not sure how usable the decals will be, but it would not be uncommon for these vehicles to be unmarked. 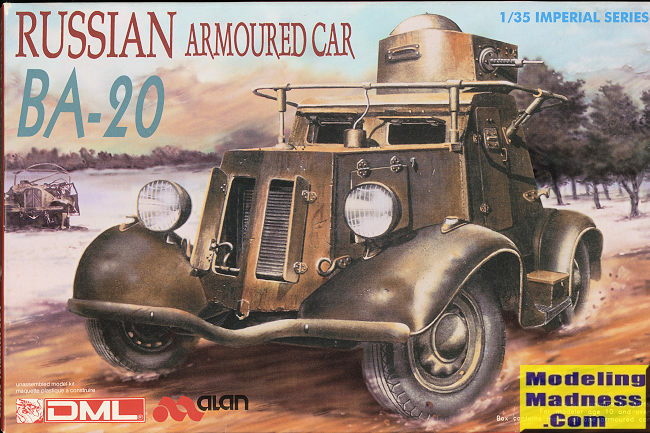 I have no idea if anyone else has done this kit in this scale, but if you are a fan of wheeled military vehicles, you may want to consider looking for one of these. They are not difficult to find.